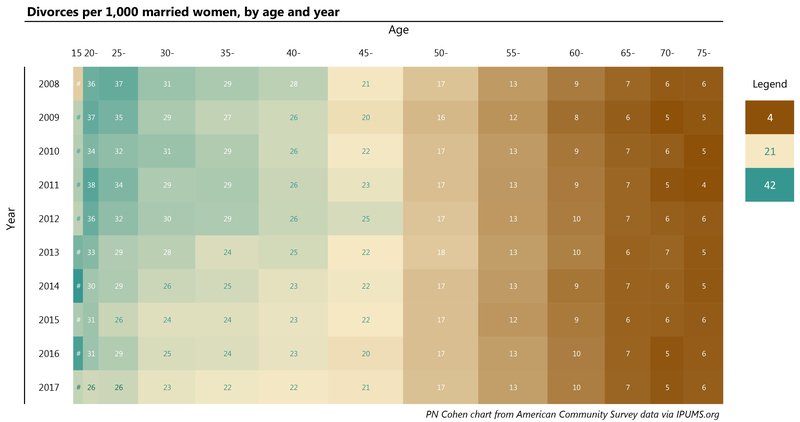 With the arrival of the 2017 American Community Survey data on IPUMS.org, I have updated my analysis of divorce trends (paper | media reports | data and code). 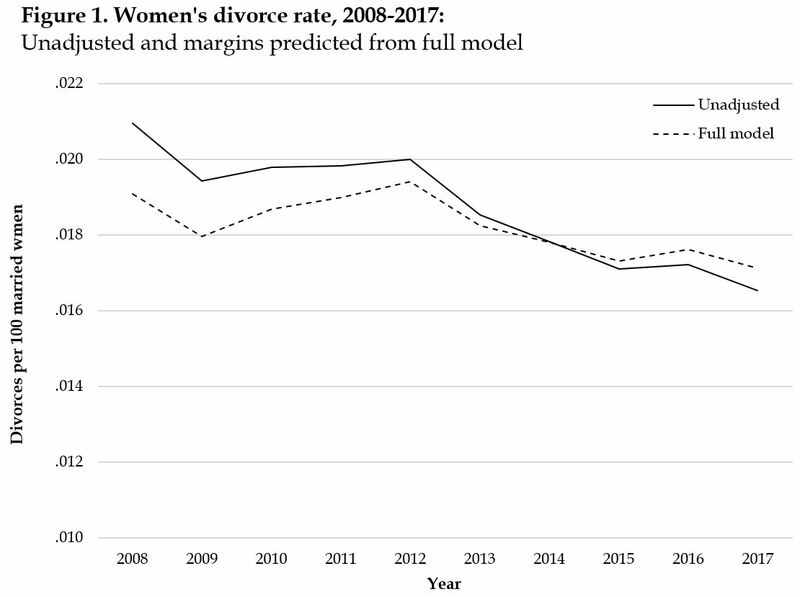 Because divorce rates have continued to fall for younger women, and because the risk profile for newly married couples has shifted toward more protective characteristics (such as higher education, older ages, and lower rates of higher-order marriages), it appears certain that – barring unforeseen changes – divorce rates will further decline in the coming years. I don’t usually make predictions, but this one seemed safe. And now the 2017 data are consistent with what I anticipated: a sharp decline in divorce rates among those under age 45, and continued movement toward a more selective pattern in new marriages. To peek into the future a little more, I also made a divorce protective-factor scale, which looks just at newlywed couples in each year, and gives them one point for each spouse that is age 30 or more, White or Hispanic, has BA or higher education, is in a first marriage, and a point if the woman has no own children in the home at the time of the survey. So it ranges from 0 to 9. (I’m not saying these factors have equal importance, but they are all associated with lower odds of divorce.) The gist of it is new marriages increasingly have characteristics conducive to low divorce rates. In 2008 41% of couples had a score of 5 or more, and in 2017 it’s 50%. So divorce rates will probably continue to fall for a while. Hey Phil, do you know if the ACS provides info redivorce rates? Not sure what that term means. ACS has marriage order, so you know how many times people have been married. But you don’t know how their previous marriages ended, so you don’t know if they have been divorced more than once, or widowed in a previous marriage.